SanDisk Wireless Flash Drive app is the best app for android phone to wirelessly store, share files and stream content across smartphones, tablets, PCs, and Macs. SanDisk wireless flash drive app cannot function on it own unless with the help of SanDisk Connect Wireless Flash Drive device in order to be able to connect wirelessly from your mobile device to the wireless drive and instantly access your movies, photos, music and documents from around the house or on-the-go while avoiding the common hassles of cables, attachment limits or Internet availability. √ Wirelessly access your movies, photos, music, and documents stored on the Wireless Flash Drive from your mobile device. No Internet or router required. 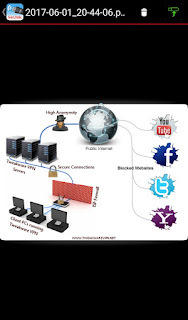 √ Stream your media content directly from the Drive. √ Upload photos, videos and other files from your mobile device to the drive and free up space on your mobile device. √ Download files from the drive to the mobile device for local access. √ Slideshow mode for photos. √ Auto-play all audio files in a directory. √ Preview documents in-app or in other apps. √ Swipe to the left or right easily navigate through content. Download the SanDisk Connect App from the link provided below. With all the above features, I believe this is the best alternative sandisk wireless flash drive app for pc. 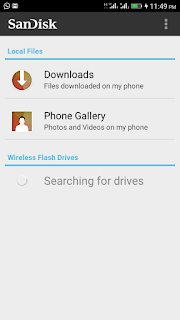 Go to your Android menu and open the installed wireless flash drive app, you will be given three(3) options either to select a file from phone gallery such as video, photo or choose the downloaded files your phone storage and from any wireless flash drive around you. 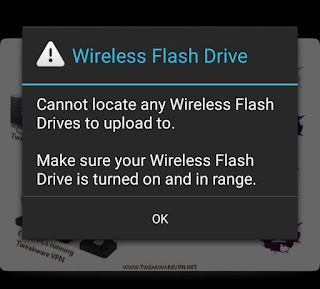 As seen in the screenshot above, the wireless drive option in the app reads “searching for drives” that means the wireless flash drive app hasn't detected any available wireless flash drive yet. To make your SanDisk wireless flash detectable, make sure you give it a full charge by plug the Drive into a computer or USB-AC adaptor. A full charge sometimes can take up to 2 hours or less. 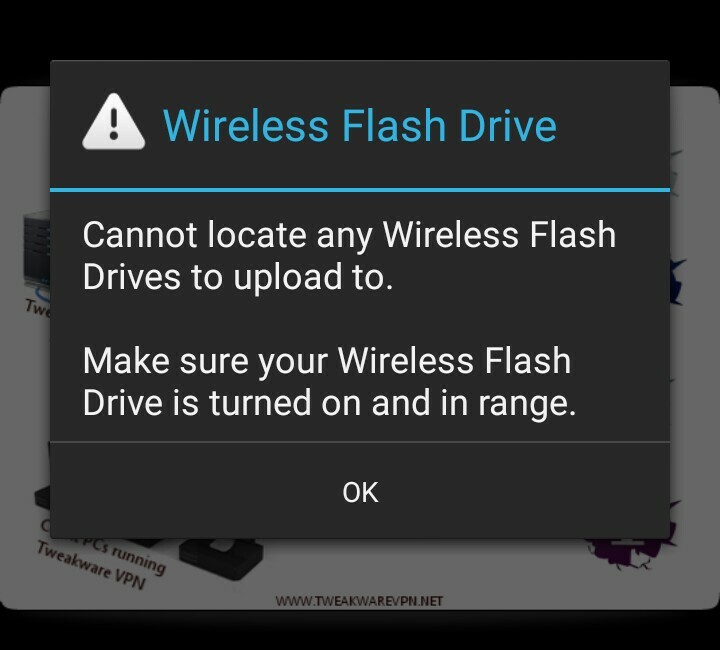 Below I have explained how to use the SanDisk Connect wireless flash drive app on Android device. Searching for drives” to get the available wireless flash drive to upload your file. 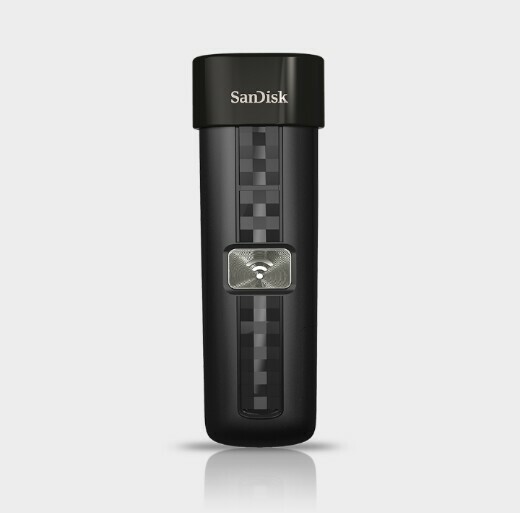 If you have to work SanDisk Connect wireless flash drive then you would see SanDisk Flash network on the list of available Wi-Fi network. 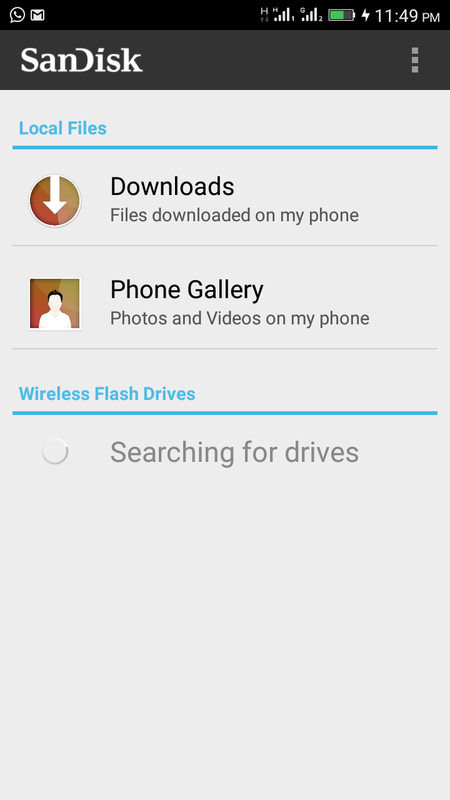 Alternatively, you can also access content on the Wireless Drive without downloading the Wireless Flash Drive app. Connect to the Wireless Drive Wi-Fi network. Launch an Internet browser and go to www.sandisk.com/WFD/ to access the Wireless Drive content. Caution: For privacy, you can set a Wireless Flash Drive Wi-Fi password in Settings > Password. Thank you for an excellent blog. And thank you a lot for giving everyone remarkably brilliant opportunity to read from this site. Hookup Appshookup apps are the best site for dating. if you want a real girlfriend/boyfriend and spend you expensive time with him/her please visit this site one time.